Animal attraction has drawn AkzoNobel and Embraer together to develop stunning livery for three of the aircraft maker’s latest line of E2 commercial jets. 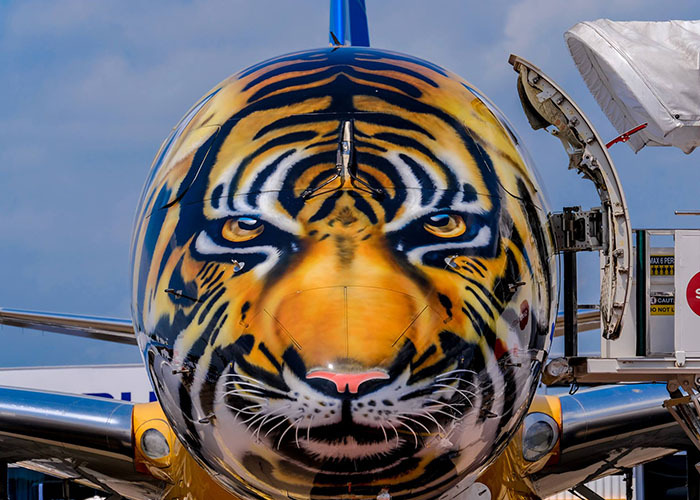 The eye-catching trio of designs – depicting an eagle, a tiger and a shark – were created using aerospace coatings from the company’s Alumigrip and Aerodur ranges. The artwork was applied at Embraer’s facility in São José dos Campos, Brazil, which houses a dedicated AkzoNobel color mixture center. Revenue was 3% lower, and flat in constant currencies. Pricing initiatives continued to gain traction, with further increases planned. Volumes were lower, mainly for Marine and Protective Coatings. Adjusted operating income increased as results of the pricing initiatives, the positive impact of asset network optimization and cost control more than offset adverse currencies, higher raw material costs and lower volumes. Operating income was adversely impacted by €6 million identified items relating to the transformation of the organization. Revenue in Q3 was 6% higher; up 9% in constant currencies and up in all regions. Growth was supported by new applications and selling price increases. The acquisition of the V. Powdertech business in Thailand continued to fuel growth and strengthen the Powder Coatings business in South East Asia. Revenue in Q3 was 8% lower, and 7% lower in constant currencies, with a continued focus on selling price increases and cost savings. Volumes in Marine Coatings continued to be affected by the slowdown of new build activity, despite some recovery in other segments. Protective Coatings volumes also decreased due to fewer oil and gas projects. We continue to implement measures focused on restructuring and right-sizing. Revenue in Q3 was 1% lower, although up 1% in constant currencies, with positive price/mix more than offsetting lower volumes. Revenue in Q3 was 4% lower, and 1% lower in constant currencies, with a continued focus on pricing initiatives. Price increases were offset by lower volumes.